Updated Monday June 26, 2017 by Rhinebeck Soccer League. 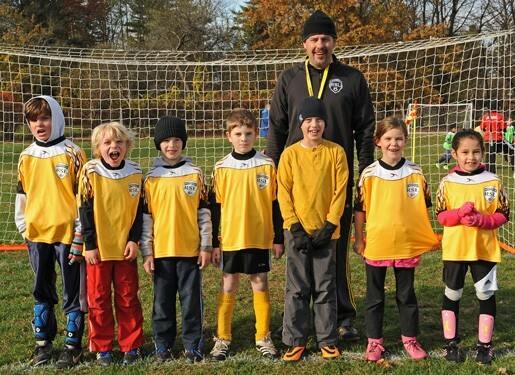 The Rhinebeck Soccer League provides recreational soccer for children ages 4 through 10. Our focus is on teaching age-appropriate soccer skills, sportsmanship and teamwork. There are two playing seasons each year, fall (September to November) and spring (April to June). All skill levels are welcome. All teams are co-ed. Players are encouraged to invite their friends to play! All home games and practices will be played at Baptist Fields in Rhinebeck. The U6 division meets once a week on Saturday mornings for 60 minutes. The session features a group warm up, then small-sided games in groups of 6-10, then scrimmages. The U8 and U10 divisions are divided into intramural teams that practice one day per week (Tuesday or Thursday) and play games on Saturday morning (8 games total each season). Our goal is to create teams that balance age, skill level and gender. Depending on enrollment, teams in the older divisions (U8 and up) may play inter-mural games against neighboring towns for some of the games. In the past Rhinebeck Recreational teams have played against teams in Red Hook, Esopus and Standfordville. As a non-competitive, developmental league, we do not keep standings. See Recreation Registration Info for pricing.